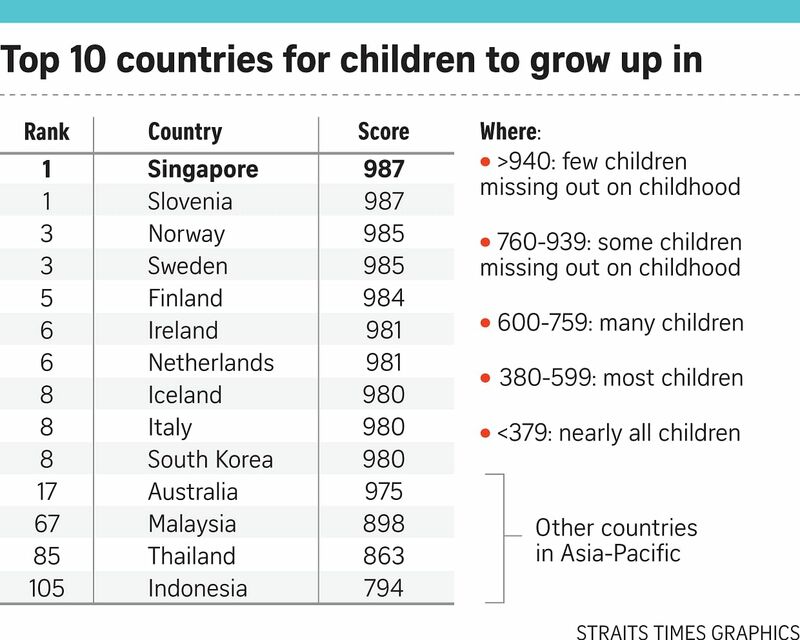 Singapore is the best country in the world for children to grow up in, according to the second annual End Of Childhood report published by non-governmental organisation Save the Children. It tied with reigning champion Slovenia as the first out of 175 countries, performing well across the eight indicators: under-five mortality rate, child stunting, out-of-school children and youth, child labour, child marriage, adolescent birth rate, population displaced by conflict, and child homicide rate. These indicators represent "life-changing events that signal the disruption of childhood", and demonstrate basic rights that can be quantitatively compared across countries. Singapore scored 987 out of a possible 1,000. Scandinavian countries Norway, Sweden and Finland rounded off the top five. The report, released in the lead-up to International Children's Day yesterday, improved on last year's by using national estimates rather than solely relying on United Nations' numbers, making the ranking more accurate, according to Save the Children. "This is a stunning result for Singapore, where children enjoy some of the healthiest childhoods possible," said Save the Children's Asia regional director Hassan Noor Saadi. Asian countries occupied three of the top 20 spots, with South Korea ranking eighth and Japan 19th. However, they also comprised four of the bottom 10 spots in terms of child stunting. Child labour and child marriage also remain prolific problems in Asia, which is home to 40 per cent of all child labourers and has the highest rate of child marriage in the world, the report said. Within Asia, children in the Philippines and Afghanistan were found to face deteriorating childhoods. Afghanistan - affected by "harrowing violence, poverty and disadvantage" - fell from 152nd place to 160th, while the Philippines fell from 96th place to 104th due to increased stunting levels and poor nutrition standards. Compared with last year, the overall situation for children has improved for 95 of the 175 countries. However, the world still has a long way to go in addressing issues facing children. More than half of all children - over 1.2 billion - live in countries mired in conflict, poverty or gender discrimination, while almost 153 million children live in 20 countries that are affected by all three. Countries affected by armed conflict have incidences of child labour 77 per cent higher than the global average and make girls more vulnerable to child marriage, the report added. Even global powerhouses had scores disproportionate to their economic development. "The United States, Russia and China may well be the three most powerful countries in the world - in terms of their combined economic, military and technological strength and global influence - but all three badly trail most of Western Europe in helping children reach their full potential," the report said. These countries stand at 36th, 37th and 40th respectively.